All Illinois Children 6 months thourgh 6 years of age should be assessed for lead poisoning. 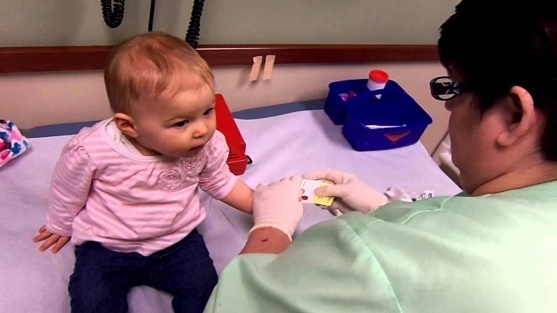 All Medicaid-elligible children should receive a blood test at 12 months and 24 months of age. ​Which Children are at highest risk? National data demonstrates that minority children are at high risk in Illinois, African-American children are more than three times as lekiely to have elevated blood lead levels as Caucasian children, and the risk of elevated blood lead for Hispanic children is double compared to Caucasian children. Children residing in older houses and apartments are at greatest risk. A recent national survery estimated that in ilder homes where children younger than age 6 reside, the vast majority have lead0based paint hazards. For homes built before 1940, 94 percents are estimated to contain lead-based paint hazards; for homes built between 1940 through 1959, 87 percent have lead-based paint hazards. In Illinois, 23 percent of homes were built between 1940 and 1959; 25 percent of Illinois homes and 46 ercent of Chicago homes were built in 1939 or earlier. ​What are the effects of lead poisoning? In its most advanced stages, seizures, coma and sometimes death. ​Newer studies suggest that cognitive abilities- math and reading skills, nonverbal reasoning and short-term memory- are affected at levels below 10ug/dL. What are the symtoms of lead poisoning? ​Since these symtoms are not specific to lead poisoning, rigorous risk assessment and blood lead testing are the only effective ways to detect lead poisoning. Why are young children at a high risk for lead poisoning? Children can absorb approximately 50 percent to 70 percent of ingested lead, whereas adults generally absorb about 5 percent. Certain developmental phases expose children to new sources of lead; for example, child oral behaviors and hand exposures to lead-containing dust on floors and windows promote lead ingestion. Children who are 1 or 2 years of age should be considered the highest priority for assessment and testing. What are the major sources of lead? The most common source of lead poisoning is deteriated lead-based paint and lead-contaminated dust in older homes. Unsafe renovation or remodeling practices can greatly increase the risk of exposure to lead dust from paint deterioration. Particularly in urban areas, soil has become contaminated with lead due to exterior paint deterioration and the past use of lead in gasoline. Other sources include parental hobbies or occupations that involve exposure to lead, water contamination from lead solder/pipes in older homes, use of lead-containing traditional medicines or cosmetics, food in imported metal-seamed cans or use of lead-containing pottery. Vinyl mini-blinds purchased before July 1997 also are likely to contain lead. Lead test Available Monday-Friday 7:30am-4:30pm at the Logan County Department of Public Health.